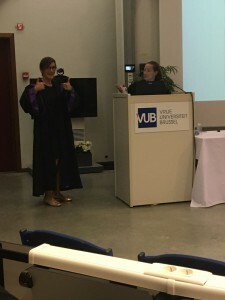 Home › Nieuws › Proficiat Doctor Lieselot Decroix! Amongst athletes, the use of nutritional supplements is widespread because of the belief that they can enhance sports performance. While sports performance largely depends on physical factors, cognitive functioning also plays a great role, as performance in many sports depends on decision making and skill accuracy. Cocoa flavanols (CF) might improve exercise performance through reducing oxidative stress, increasing blood flow and improving cognitive function. It was the purpose of this PhD to identify the effects of CF on physical and cognitive performance in healthy athletes at sea level and altitude, as well as in patients with type 1 diabetes. In a first study, we showed that acute CF intake (900 mg) increased prefrontal oxygenation in athletes during cognitive performance, but without affecting executive function. The effects of high-intensity exercise largely overruled the effects of CF intake: large beneficial effects of exercise on prefrontal oxygenation and cognitive function were observed and CF supplementation did not enlarge these effects. In a 2nd study, the effect of acute CF intake (530 mg) on cognitive performance was assessed in normoxia and hypoxia (simulated altitude 4000 m). Electroencephalogram and fNIRS were used to analyse neuronal activity and hemodynamic changes. Acute CF intake improved the neurovascular response, but did not affect neuronal activity and cognitive performance. Most cognitive functions, the cerebrovascular response and neuronal activity, were not altered in hypoxia in healthy subjects. In a 3rd study, we found that acute intake of 900 mg CF enhanced cognitive performance on the Flanker test in patients with type 1 diabetes, and their healthy matched controls. CF intake increased the BOLD response in brain areas activated during this specific task. While cognitive performance was not deteriorated in patients with type 1 diabetes, a different brain activation pattern during the cognitive task was observed, compared to healthy controls. To conclude, acute CF intake improves prefrontal oxygenation and cerebrovascular responsiveness, but this but does not result in improved executive function in healthy persons and athletes. Compared to exercise, the magnitude of the CF-induced neurovascular changes is small. Two studies were conducted examining the effects of CF on exercise-induced oxidative stress, NO availability and its implications for exercise performance, in well-trained cyclists. We found that acute CF (900 mg) improved the exercise-induced increase in total antioxidant capacity, but did not reduce the exercise-induced increase in lipid peroxidation. One week CF intake (530 mg CF) improved vascular function at rest, and prefrontal oxygenation at rest and during low-intensity exercise in normoxia and hypoxia, but did not influence muscular oxygenation. Thus, one week CF intake partially restored the hypoxia-induced decline in prefrontal oxygenation during rest and low-intensity exercise, but not during high-intensity exercise. One week CF intake reduced exercise-induced lipid peroxidation, but did not alter total antioxidant capacity. Both acute and 1-week CF intake did not improve exercise performance and recovery and do not change NO production during exercise (in normoxia and hypoxia) in well-trained athletes. Thus, we showed that both acute (900 mg CF, 196 mg epicatechin) and 1-week (530 mg CF, 100 mg epicatechin/day) CF intake cannot improve cognitive performance, nor physical performance in healthy, young athletes and should therefore not be consumed as a performance-enhancing aid. However, CF intake can be considered as a nutritional aid to stimulate cerebrovascular responsiveness and to maintain cerebral oxygenation in normoxia and hypoxia, both at rest and during low-intensity exercise.